As a teenager, Ashley Duhon realized she wanted to become a doctor so she could help people, like her mother, who suffer from medical complications due to type 1 diabetes. Duhon, now a medical student at Louisiana State University Health Sciences Center New Orleans School of Medicine, spent her summer at Vanderbilt University Medical Center (VUMC) participating in the National Institute of Diabetes and Digestive and Kidney Diseases (NIDDK) Medical Student Research Program. The Vanderbilt Diabetes Research and Training Center (VDRTC) is the coordinating center for the program, and this summer, 136 medical students from more than 60 U.S. medical schools have been at NIDDK-supported diabetes research centers across the county conducting investigations on diabetes, obesity and metabolism. Vanderbilt hosts the largest contingent of these medical students, and this year 38 participants made Nashville their temporary home. The national program is based on the VDRTC’s experience running such a medical student research program for more than 30 years. The students working at Vanderbilt are supported by National Institutes of Health (NIH) T32 and T35 training grants affiliated with the VDRTC. At summer’s end, all of the program’s participants gather for a two-day research symposium on the Vanderbilt campus. This year’s event, organized by the VDRTC, is Aug. 2 and 3, and medical students will interact with prominent NIDDK-supported physician-scientists, present their research during poster sessions and hear about career options in diabetes research. Duhon’s motivation for participating in the program is someone she thinks about every day, her mother. Her mother’s pregnancy was complicated by diabetes, leading to Duhon’s premature birth. Her mother died just after Duhon’s freshman year of college, and the loss solidified her daughter’s resolve to make a difference. 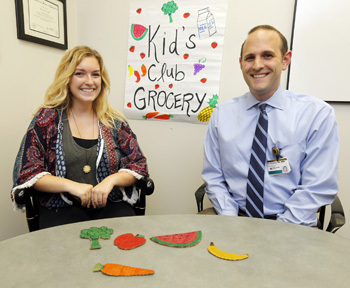 At VUMC, Duhon worked as a research intern for Bill Heerman, M.D., MPH, assistant professor of Pediatrics, the principal investigator for the Competency-based Approaches to Community Health (COACH) study. The study looks at the effectiveness of family-centered, community-based behavioral obesity interventions for at-risk families, and Duhon developed and implemented a curriculum for young children used as part of the study. The interactive lessons teach children about making nutritious food choices with the goal of instilling more healthy behaviors. Duhon said the summer program also opened her eyes to a form of research she had not yet been exposed to — community-based, public health investigations. She believes this type of study suits her interests better than basic science or bench research. Each medical student in the Vanderbilt program works with a VDRTC-affiliated faculty member like Heerman and conducts research in a laboratory or a clinical research setting, reflecting Vanderbilt’s broad strength in diabetes research. Students also learn about challenges in diabetes clinical care and career pathways for physician-scientists. John Stafford, M.D., Ph.D., and Lan Wu, M.D., are associate directors of the VDRTC-coordinated student research program at VUMC, and Deborah Caplenor Brown and Suzanne Starr manage the program.